FWE has developed a performance focused re-design of our Low Temp Cold and Old Oven family to include the "G2 Series." We have improved the element design, air delivery, insulation, control system and ability to handle large volumes of dense foods for high-volume operators. The G2 Series expands the Cook and Hold Oven options available from FWE with a re-design to meet the changing demands of the commercial foodservice market. The G2 Series ovens have an enhanced element design that allows for more balanced heat, eliminating temperature stratification and re-directed airflow gently pulls air over the product and back through the elements for even coloration. This new heat delivery system is paired with a better insulation pack and easier to use controls. 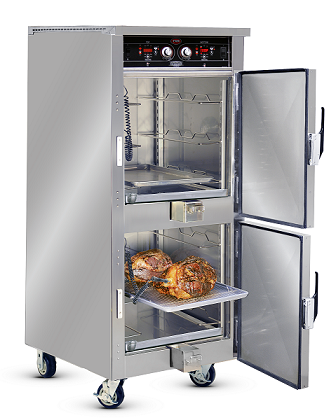 The G2 Series offers users a unique option in the commercial Cook & Hold Oven category as it provides not only high yield cooking, but also natural browning with 85% radiant heat and 15% gentle forced convection. Many competitive units require chemical browning agents or additional steps to get roasts in sellable visual condition (i.e. not grey), the G2 series eliminates those additional steps. The standard G2 series units are UL approved for vent-less applications allowing for production expansion without costly ventilation systems (local codes prevail). Intuitive, easy to use and kitchen friendly controls have 8 programmable recipe presets for better product consistency and ease of use for all levels of staff. Units are provided with an internal product probe, allowing for options to cook and hold by probe or by time without constant monitoring. Exclusive unibody design provides the ultimate menu flexibility with two individually controlled compartments in the same small space saving foot print, with one plug. Field reversible doors are standard for added convenience. Low voltage models are available. These models are able to produce extremely high yield production results from a single 120V, 20A outlet. FWE's Cook and Hold System works with little or no air movement to create a gentle and uniform heat that surrounds the product to cook and hold it at a safe temperature. The gentle air circulation reduces product shrinkage and maintains high product yield. The unique heat system first cooks food to a precise and uniform temperature; then gently holds it for hours upon hours. Once food has reaches the preset temperature, an internal probe tells the LCH to switch to 'hold' mode, allowing for a natural maturing phase, which locks in moisture and flavor, keeping your menu items at that just-cooked quality and precise serving temperature. Since units do not need to be constantly monitored, products can be prepared day or night. Utilizing recipe presets, kitchen staff is able to set a product to start cooking before a shift ends. The cabinet will then cook to a predetermined setting and automatically switch to a hold cabinet once everyone else has gone home. These overnight cooking methods thus offer labor savings. These ovens typically require less energy than a conventional oven, and when they are used overnight, they utilize off-peak electric rates for even greater savings. The G2 Series can be combined with available smoke feature. With the 'smoke drawer' added to the bottom of the unit, up to 4 hours of smoking can be achieved using wood chips. Load with your selection of wood chips to create just a hint or bold flavor. To learn more about our LCH smoker options, visit www.fwe.com/products/smokers. 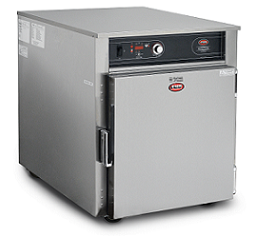 When not being used for cooking, FWE LCH-G2 units can be used just for holding prepared foods. When used for reheating or holding prepared foods, these ovens reduce drying, shrinkage and flavor loss. Since smoke elements run independently of heating elements, smoker ovens are able to cold smoke cheeses, fish and other products. Visit www.fwe.com/learn/An-Introduction-to-Low-Temperature-Cooking to learn more about first generation low temperature cook and hold ovens. When you need it fast, many models are available to ship in 48 hours. To learn more, visit www.fwe.com/quick-ship (Quick Ship terms and conditions apply). To learn more about features and accessories, see literature, additional photos and get a quote, visit www.fwe.com/products/low-temp-cook-and-hold-ovens.